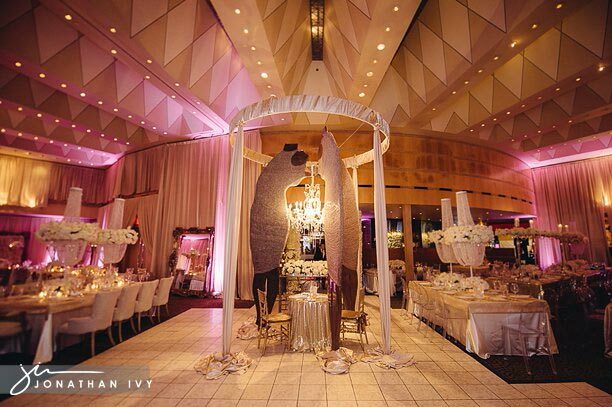 We give you Jonathan Ivy Photography’s very first Tony’s Restaurant wedding reception. Erin first contacted us online and we had an instant connection. We went out and captured their engagement photos early in 2013 and found out just how wonderful these two are. Atelier du Papier, did a fabulous job on all the paper and invitations for the wedding and Darryl & Co knocked it out of the park with styling and design. It was like having your cake and eating it too! This wedding just kept on giving us more beautiful things. Erin then told us she was having her gown made by Vera Wang and it was almost more excitement than we could take. Just wait till we show you the grooms Hogwarts cake! It is amazing! So without further adieu, we give you the gorgeous wedding of Mr & Mrs Paul Yoon! Above is Erin’s Vera Wang gown she had created especially for her beautiful day! The gown was absolutely perfect! She chose the perfect pair of Christian Louboutin heels to compliment her gown. They even brought along their very own “official” ring guard! The bride has a custom bouquet created by Darryl & Co for her portraits. Isn’t it stunning! Darryl & Co also came through Tony’s and created a masterpiece! Another stunning cake by Susie’s Cakes! She never ceases to amaze us. We highly recommend this cake artist! The groom’s cake was a Harry Potter themed Hogwarts Castle at its finest, also created by Susie’s Cakes. This cake was larger than life! Above is a New Orleans tradition, the Second Line parade where the bride and groom march, walk and sometimes twirl a parasol or handkerchief in the air during the celebration. The groom is from New Orleans so they celebrated with several traditions brought from his home state. Below you will see the masquerade masks as well.